Ninth Annual! October Tenth! We are movinggggggggg! As much we’ve enjoyed zine-festing under the shiny disco ball and will miss being in that rainbow building visible from the interstate, sometimes you gotta make changes just to see what other places have to offer! Richmond Public Library, located at 101 East Franklin Street, has been an ardent supporter of community projects such as the People’s Library and Girls Rock! RVA. When an opportunity to investigate how Richmond Zine Fest could work within that space, we decided to invade! 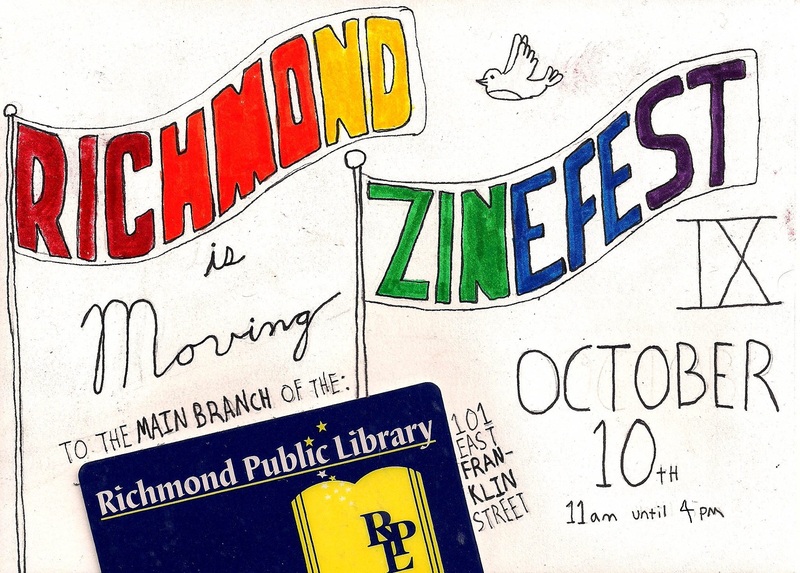 We’re still in the planning stages, and if you’re interested in being involved in the making of the 9th Annual Richmond Zine Fest, please contact us at zine.fest@richmondzinefest.org! We need artists, writers, planners, and go-getters! Keep checking in for more updates on events, including an exciting series of zine programs available at several Richmond Public Library branches during late June and throughout July aka International Zine Month. Perhaps this year, we’ll succeed in the mission to actually finish the daily challenges… hahahahahahahahahahahaha. Right. Zine, love, and hopefully see you Saturday, October 10th! Registration for tablers and workshops open in July. Next Post Year 10, Baby!